Marie is accessed via a private funicular railway through the mountain, and located in the exclusive Petit Village area of Zermatt. The chalet sleeps 12 guests in 6 large en-suite bedrooms spread over multiple floors. 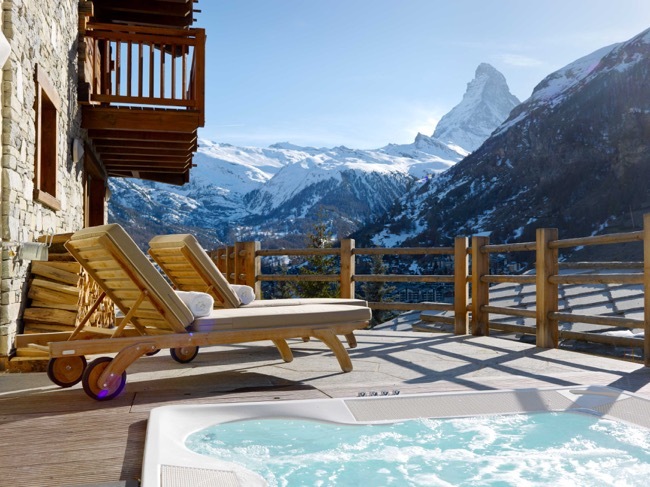 5 of the 6 bedrooms all feature private balcony / terrace overlooking the Matterhorn and surrounding mountain terrain. The master suite is spread over the entire top floor, featuring an open fire, a double height pitched ceiling and floor to ceiling windows. Featuring a sauna, dedicated shower & WC, massage room and outdoor terrace with loungers and Jacuzzi. Tucked away in the secluded Plan-Praz area of Verbier, 350m2 Chalet Pierre Avoi is a stunning mountain retreat. The interior has been beautifully designed, with modern art works adorning the natural mineral walls and elegant furniture throughout. The chalet’s heart is its double height living area, complete with stone fireplace and floor to ceiling windows, which open up to a huge south and south-west facing decked terrace. The chalet offers cosy sitting rooms, bedrooms with wonderful linen, and three fire-places (one of which can be found in the master bedroom). It also features beautiful balconies and a terrace overlooking the stunning vista of the resort.